I originally posted my review of AncestryDNA on 11/20/12. In this post I outlined the Good, Bad and Frustrating of AncestryDNA. You may want to read that post, too. Since some of the reasons that investing in the AncestryDNA test still may not be worth it for you are still true today. 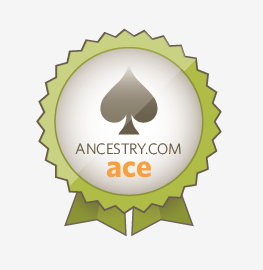 In October 2013, AncestryDNA just launched their "new" AncestryDNA results. They have made some updates and refinements. As with the original AncestryDNA results, it is exciting, but it is still not perfect. In my original results, it showed that I had 40% of my ancestry originating (DNA wise) from Scandinavia. Which was directly at odds with all my research which showed I had a large number of my ancestors from Scotland and England. I was interested seeing if the new refinements were any different. There results seem to be more inline with what my research has uncovered with the exception of the Ireland and Italy/Greece ancestry. The only Irish ancestry I know that I have is from my 3rd Great Grandparents - William and Margaret Armstrong, who came here from Ireland in the early 1800's. Interestingly, this is a separate Armstrong family than I have written extensively about. It isn't clear to me if this Armstrong family (William and Margaret) may have come to Ireland from Scotland. So there may not be ANY Irish ancestry from this part of the family, too. The unknown in this analysis is that my grandfather on my father's side is unknown. Does this indicate that he was Irish with some tiny amount of Italian/Greek ancestry? Or are the results just inaccurate? Maybe further refinements in the AncestryDNA results over time will provide better information. A five months ago, I did receive a DNA match for a 2nd cousin. It is a person that I wasn't aware of before. He/She appear to be descended from my great aunt. Which was exciting to see. What made it less exciting was that when I tried to reach out to them, I am yet to hear back from them. Which continues to confound me that people invest in the AncestryDNA test and aren't more interested in connecting with their distant cousins. Still waiting for the "surprising" DNA results which are going to open some previously unopened doors for the genealogical research.